In December, seven bobcats were reported to this column by Westford residents. 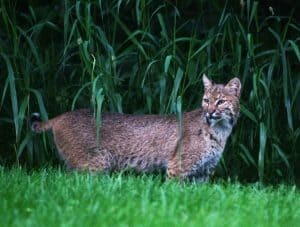 Though we have been seeing bobcats in Westford since 1995, seven sightings in one month is an unusually high number. In 1995, there was one report of one animal, then no reports for many years. Between 2007 and the present, there have been between five and thirteen sightings reported every year. Given the large territorial range of bobcats, it is probable that some of these sightings are of the same animal. However, some are described as large, some small, some kittens, and the sightings are from many different areas of town. It seems that bobcat families are here to stay, and Westford reporters surely appreciate their beauty. In the past, the bobcat (Lynx rufus) was hunted nearly to extinction for its beautiful coat. But in the 1970’s international laws were put in place to protect them. Populations rebounded and the bobcat is now America’s most common wildcat. Bobcats stand twelve to twenty-four inches at the shoulder and weigh eight to forty pounds, with males being larger on average than females. New England and Canada have the largest bobcats. Western bobcats are a smaller subspecies. The bobcat’s coat is tan to greyish brown, with black streaks on the body and dark bars on the forelegs, spotted patterning and ears black-tipped with short black tufts. The stubby tail is about seven inches long and has a black tip. They have excellent sight, hearing and smell and are good climbers, with retractable claws like a house cat. Bobcats have long back legs and are capable of short bursts of speed. However, they mostly hunt by quiet waiting and pouncing on their prey rather than running it down. They can even swim if necessary. Bobcats are most active at dawn and dusk. Average life span in the wild is seven to ten years. Bobcat range includes most of the United States, and southern Canada to central Mexico. They are adaptable to most environments. Bobcats are mostly solitary, except when a female has dependent kittens. Territories range from five to forty square miles. At thirty-two square miles, Westford could host up to six adult bobcats. Territories may contain up to three den sites. Dens are hollow logs, leaf and branch piles or rock caves. Males may mate with two or more females in their territory. The female gives birth to up to six kittens in April or May after a two month gestation period. They stay with her until the fall when they leave to set up their own territories. In New England bobcats prey mostly on cottontail rabbits, but they may also eat rodents, birds and even small deer. Though bobcats are seen in yards and around bird feeders, they rarely approach humans. We are fortunate to have some of our former wild animals returning to Westford as the area becomes more forested. ** The 2019 Great Backyard Bird Count is coming right up. On February 15-18 count the birds at your feeder or in your yard. The bird count website states, “Each checklist submitted during the GBBC helps researchers at the Cornell Lab of Ornithology and the National Audubon Society learn more about how birds are doing , and how to protect them and the environment we share.” This is a worldwide count. Count the highest number of each species you see during this time period, and send your reports online to gbbc.birdcount.org. At this website you can see the reports which came in from all over the world in 2018. You will also be eligible to enter counts on e-bird from this website at any time. After you do that, please send them to Westford Wildlife Watch. Many thanks to all flora and fauna reporters for the month of January. Please send reports before February 26 for inclusion in next month’s article. You can write me at 7A Old Colony Drive, call me at 978-692-3907, or e-mail me at mariancharman@gmail.com. Marian/Bill Harman, Old Colony Drive. December 26, a pileated woodpecker flew across Old Colony into the woods. December 30, one titmouse, three goldfinches, four juncos, two chickadees, one white-breasted nuthatch, one downy woodpecker, one female hairy woodpecker at feeder. Meyer Franklin, Heywood Rd. January 7, the trailcam took a photo of a bobcat in the yard. Sue Bonner, Plain Rd. January 7, fourteen turkeys in our yard every day. They fly up into the trees to roost. “One day recently, several came up on our deck, peered in our slider and entertained out two cats who were watching from the window.” We saw a flock of at least thirty on Lowell Rd. a few days ago. MassWildlife biologists estimate the population in the state at about 25,000 now, up from 37 reintroduced in the 1970’s. Mary Bowser, Tadmuck Lane. January 10, two beautiful bobcats walking through back yard. Tom/Carolyn Luminello, at Crusade Rd., turkeys roosting in the trees, pileated woodpecker in the yard. Marian Harman is a member of the Westford Conservation Trust, a non-profit conservation organization whose purpose is the preservation of Westford’s open spaces and trails. The Trust welcomes new members and volunteers. Check out the Trust website at westfordconservationtrust.org or visit us on Facebook.